According to the calendar today is February 29, 2016 known as leap year. 27 Miracles has their special for leap year today. Call us today to take advantage of it 407-905-5454 as the offer expires today at midnight! Today is the day when you were in school that they would have Sadi Hawkins day . See some of the traditions as written by columnist Bob Driver for the Clearwater Sun describes it. Click the link for the full article. In olden days, Feb. 29 was also celebrated as Sadie Hawkins Day, the time when girls were permitted to ask the boys of their choice for a date or whatever else the girl might have in mind. Sadie Hawkins was the invention of Al Capp, a brilliant cartoonist who for 40 years or so drew the comic strip Li’l Abner. In the strip, Sadie was the homeliest girl in Dogpatch. She never had a date or a boy friend. Finally, as she reached the desperate age of 35, her father decreed that on a given date every spinster in Dogpatch would be entitled to pursue any unmarried male of her choice. If by sundown she could drag him across the finish line, the man had to marry her. Capp invented Sadie Hawkins in 1937, as one more colorful character in the Li’l Abner cast. By the early 1940s the idea of an annual Sadie Hawkins Day had swept the nation. Each February, hundreds of colleges and high schools held Sadie Hawkins dances and carnivals. At one point an estimated 40,000 events took place. A related tradition sprang up which decreed that every four years – on Feb. 29 – women were free to propose marriage to their sweeties. I’m not sure anyone knows how many weddings were generated by this Leap Year custom. I do! 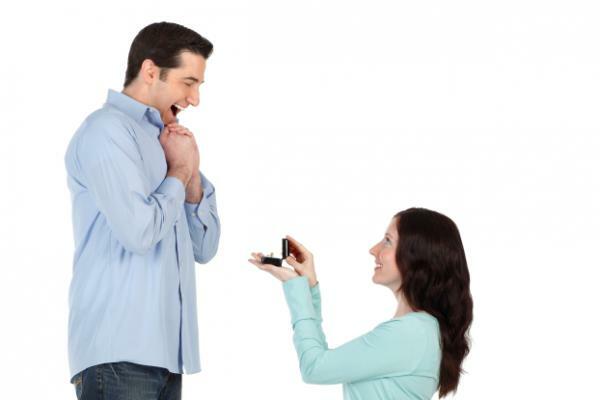 Traditionally, women take the ring into their own hands and propose on Leap Day. ’Leap Day’ is February 29, which is an extra (intercalary) day added during a Leap Year, making the year 366 days long – and not 365 days, like a common (normal) year. Nearly every 4 years is a Leap Year in our modern Gregorian Calendar. Ever since Leap Years were first introduced over 2000 years ago with the transition from the Roman Calendar to the Julian Calendar in 45 BCE (Before Common Era), Leap Day has been associated with age-old Leap Day traditions and folklore. What is a Leap Year and when is the next one? When and what is Leap Day? In some places, Leap Day has been known as “Bachelors’ Day” for the same reason. A man was expected to pay a penalty, such as a gown or money, if he refused a marriage proposal from a woman on Leap Day. In many European countries, especially in the upper classes of society, tradition dictates that any man who refuses a woman’s proposal on February 29 has to buy her 12 pairs of gloves. The intention is that the woman can wear the gloves to hide the embarrassment of not having an engagement ring. During the middle ages there were laws governing this tradition.